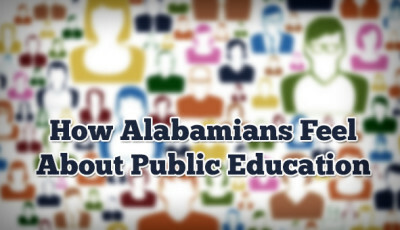 The results are in: Alabama’s system of funding K-12 public education is most certainly inequitable. And nowhere near adequate. 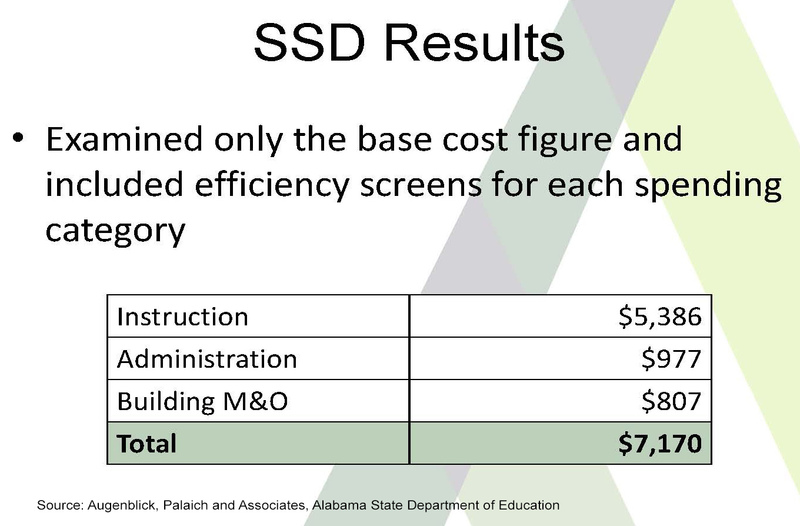 Justin Silverstein of Augenblick, Palaich and Associates (APA) delivered those results at September’s state board of education work session where he presented an overview of the findings of a two-year study of how Alabama funds its schools. APA has worked in all 50 states to examine equity and adequacy in school funding. Silverstein presented the results of three studies. One examined equity and two examined adequacy. He started by explaining that the Foundation Program Alabama uses is typical among SREB (Southern Regional Education Board) states and is based on a system from 20 years ago, built on statewide salary schedules and drivers that don’t take into account what students need on a per pupil level. This method limits the flexibility districts have to use state funding to address student needs. Under the Foundation Program, Alabama essentially treats all students the same, regardless of whether a student is at-risk of academic failure. At-risk students include students in poverty and English language learners (ELLs). When a district has high numbers of at-risk students, those needs must be targeted with very specific additional resources in order for students to succeed. Silverstein said school funding models are moving away from Foundation-type programs and moving toward student-based budgeting, which does take into account the needs of students. With student-based budgeting, students with higher needs “earn” more state funding based on weighted amounts based on a student’s need. The equity study measured how resources are allocated among districts and students. Horizontal equity looks at whether similar districts treated similarly. Are the dollars being distributed similarly among districts who are similar? Vertical equity looks at whether funding is tied to the needs of students. Fiscal neutrality looks at whether where a student lives determines the amount of available resources for education. Research indicates resources for education should not differ by a student’s location. When equity is out of whack, you end up with districts of “haves” and “have-nots”. 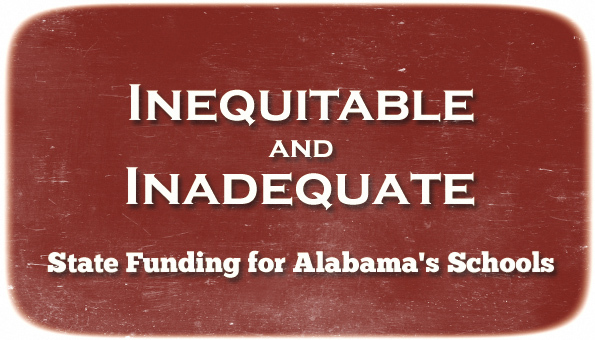 On all three measures of equity, Alabama comes out as inequitable. And even though fiscal neutrality isn’t yet on the level where a red flag needs to be thrown, it is getting there. These maps from FY13 clearly show that where a student lives determines the amount of spending on instruction here in Alabama. For the adequacy studies, the question is how much does it currently take to provide the level of education the state expects of students? Two approaches were used. The first is the Successful School District (SSD) methodology. APA identified 13 Alabama districts that met two specific performance criteria. They then looked at what these districts were spending in base costs. Base costs included only instruction, administration, and building maintenance and operations. No spending on special education, at-risk or ELL students, transportation, nor any capital expenditures were included. Here are the districts used in the study. Notice they are all city districts. The results showed that these successful districts spent $7,170 per student in base costs. The Professional Judgment (PJ) method utilizes the “experience of Alabama educators to identify the resources needed to meet state standards, ” according to Silverstein. Fifteen panels were convened with 80 school representatives from across the state. Basically, representatives were personnel from four representative districts from across Alabama and included teachers, principals, chief school financial officers, and other administrators. Panel members discussed resources, but they never discussed dollars needed to acquire those resources. Base costs for those resources were identified, and adjustments to meet identified student needs were developed. The size of a district was also taken into account. Silverstein said these weights are in line with other states. For modeling purposes, APA used the figures below. 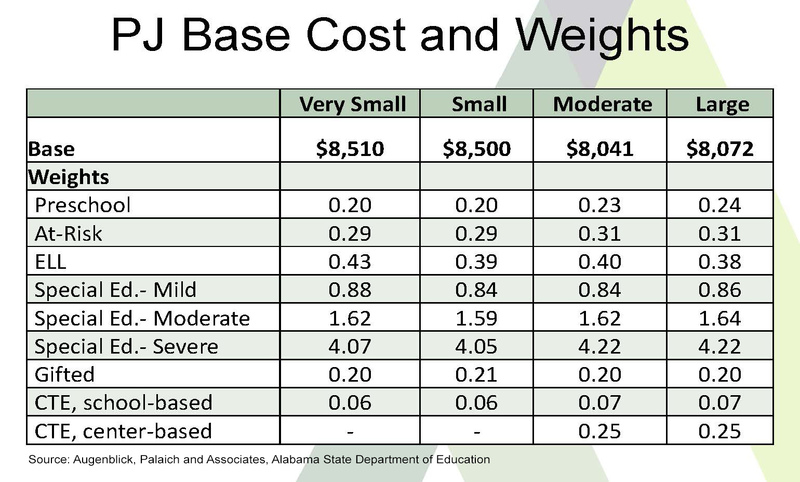 Silverstein mentioned that they combined the special education weights, using 1.10 as the average of the overall cost from the three factors broken out above for modeling purposes only. And here is the model with numbers attached, showing current expenditures, and both methodologies, with and without size adjustments. That bottom line in the chart shows that Alabama is providing anywhere from 22% to 37% less funding than what the SSD and PJ models show is needed to provide an adequate education to Alabama’s students. Silverstein emphasized that no state is going to be able bridge a gap like that immediately. He also noted that in FY13 (the numbers used in the study) six of the districts studied were spending at or above the SSD amount. Four were spending at or above the PJ amount. 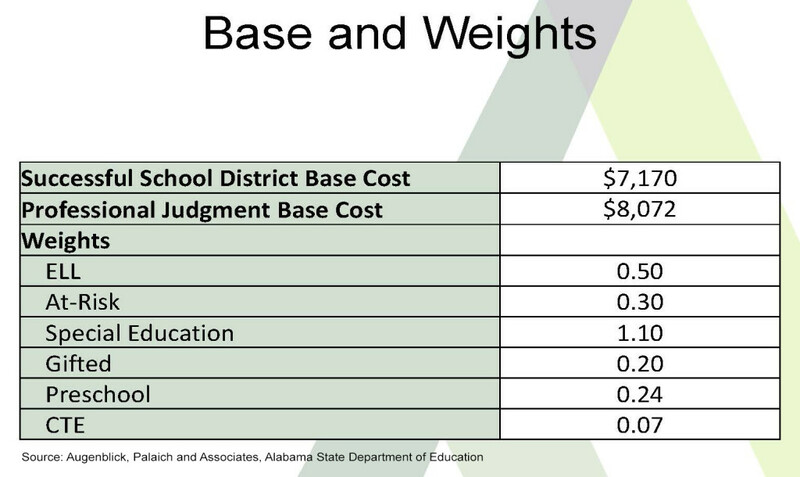 Here’s a look at how much money Alabama school districts spent in FY13 per pupil. Consider introducing additional revenue to fund education. The first recommendation would distribute funding based on student needs, using weights determined in the adequacy formula, but would not address the level of funding. The second recommendation takes a “power equalization” approach, which Alabama already uses in distributing capital funding among Alabama’s schools. Using a “power equalization” approach would say to voters that if they were willing to tax themselves, the state would guarantee a rate of return. This provides an incentive to those who don’t really have the capacity to reach the same level of local funding that wealthy districts can attain. Of course that would require the state to actually have the funds to distribute, but it would not require any districts to contribute their local monies to pay to the state for the benefit of any other district. The third recommendation, raising revenue, is a long-term approach. Silverstein suggested using the SSD amount, $7,170, as a base starting point for adequacy. Board member Stephanie Bell asked whether investing additional money will actually make a difference, giving examples of districts whose use of resources hasn’t proven to positively impact student success. Silverstein said that if money is targeted at the right students and spent the right way, it will positively impact student success. The thirteen districts in the study are showing that it can be done, he added. He stressed the need for a strong accountability system to ensure performance measures are reached, adding that lack of achievement funding could no longer be used as an excuse for lack of success. It is important to remember that funding for transportation is not included in this model. Silverstein said because transportation needs are based on geography and are very diverse across the state, the student-based approach won’t work for transportation. He said that he heard over and over about how transportation is poorly funded at this time as he gathered input from folks across the state. Bice said that transportation is underfunded by $64 million across the state. Districts are having to use local money to fill that gap. As these recommendations are being considered, Silverstein stressed that revising funding mechanisms is an ongoing process. States should always be looking at data, examining what costs are from year to year and re-benchmarking based on what successful school districts are doing. He cautioned that if districts are not reaching the higher standards expected using the SSD model, then the board should look toward the PJ model. Board member Matthew Brown questioned again whether additional funding would make a difference, stating his belief that parental support was crucial to student success. Silverstein responded that basing funding on student needs is an attempt to create “an even playing field in a completely uneven world”. 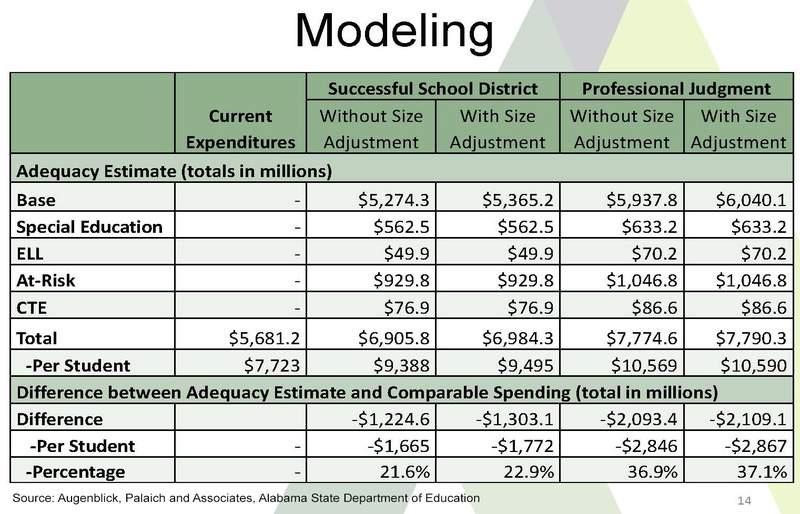 Bice told board members that these funding models will be applied to Alabama’s school systems and those numbers will be presented at the October board work session to allow them to see what funding might actually look like. “I’m not saying we’re going to do it. [But] the Foundation Program has been around since 1995. Twenty years later, a few things have changed,” Bice said. The next board work session will be held on Thursday, October 8, at 1:00 p.m.